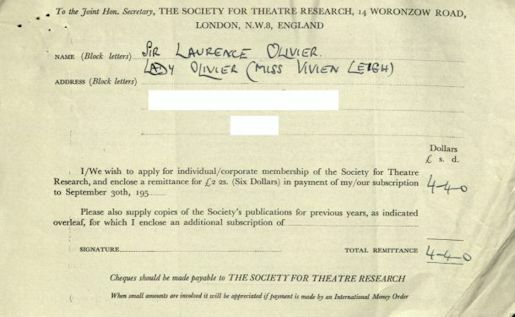 The Society for Theatre Research was founded in 1948 and has just celebrated its 70th anniversary. It serves all those interested in the history and technique of British and British-related theatre: academic and independent scholars, researchers, performers and other theatre workers – and of course theatregoers. The only qualification for membership is enthusiasm for the subject. Founded to encourage research into past and present British theatre practice, the STR is the oldest society of its type in the English-speaking world, with a membership that is international. The Society’s existence added weight to the recognition of theatre as a subject of study in its own right and helped give impetus to the establishment of Departments of Drama in British universities. From the beginning the Society has been actively involved in campaigns to save historic theatres and to preserve theatre records. Its successes include the setting up of the International Federation for Theatre Research in 1956 and the insertion of a clause into the 1968 Theatres Act requiring all performed playscripts to be deposited in the British Library. The Society’s fight for an independent Theatre Museum lasted several decades and was rewarded in 1987 with its opening in Covent Garden. Although this display was subsequently taken back to the Victoria & Albert Museum in 2007, the Society retains a strong interest in the welfare of its collections and archive, which includes its own library. Its principal activities are publishing specialist theatre books and a thrice-yearly journal Theatre Notebook; staging an annual programme of lectures, study days and other events; furthering enquiries and maintaining a register of members’ research interests. Every year it offers a series of awards to support research and presents a prize for the best theatre book of the year. Its most recently introduced activity is the New Researchers’ Network (NRN), a supportive group for postgraduates, new scholars, practitioners, and Early Career Researchers More details of these and other activities promoted by the Society, such as the Poel Workshops for recent entrants to the acting profession, will be found elsewhere on this website under the relevant tabs, as will information about how to join the Society and participate in its life. Past and present members, supporters and beneficiaries include Terence Rattigan, Donald Sinden, Margaret Rutherford, John Gielgud, Sybil Thorndike, Edith Evans, Sian Phillips, Judi Dench, Henry Goodman, Alan Rickman, David Bamber, Ray Fearon, Anthony Hopkins, Simon Callow, Peter O’Toole, Barbara Jefford, Frank Thornton and Richard Briers.